The verb “cleave” has two contradictory senses in English: it means both “to separate” and “to join together” (and so figures its own self-separated, self-joined meanings). Out this week is a journal article in which I discuss “cleave” and other self-antithetical words (I call them “antagonyms”) when they occur in English poetry, as well as the implications of antagonymy for reading. To think about this, I look at a small selection of poems: “I felt a Cleaving” by Emily Dickinson, “A Hagging Match” by Seamus Heaney, “Insolent storm strikes at the skull” by Sylvia Plath, a couple by Geoffrey Hill (Péguy and Orchards, as well as some essays), and “Even now your eyes are mixed with mine” by Isaac Rosenberg. Shakespeare and Crashaw and Keats are in there, and so are Empson (on ambiguity), Derrida (on pharmakon), Hillis Miller (on parasite), Plato (on Thamus), Freud (on Egyptian and dreams), and the KJV. [Read a PDF of the article here]. 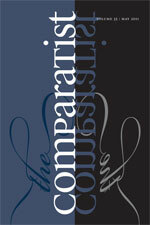 The full table of contents for this issue of The Comparatist, the theme of which is “antagonisms,” is here. Fascinating paper–breathtaking in its scope. Sorry for the cliche “breathtaking.” I meant the scope of the paper was broad–from Shakespeare to Hill, or four centuries in 17 pages! Thanks, Gord – I’m glad you found it worth your while. A frequently-cited antagonym is Latin altus, which may mean either ‘high’ or ‘deep’: a mons altus is a high mountain, but mare altum is the deep sea. Yet this particular opposition may be reconciled directly, and I think the Romans saw the word as having only one sense, which may be glossed ‘vertically long’. That is, we call something high in English if we notionally stand at its bottom and look up, and deep if we notionally stand at its top and look down. I say notionally rather than actually; a mountain is still high even from its summit. The Romans apparently did not bother with this distinction, though in the Romance languages, I believe, the meaning is now always ‘high’. In general, then, we can say that all oppositions, whether expressed in a single word or in different words, are very close together indeed, differing only in a single feature and sharing all their other features. The meanings of black and blanc have almost everything in common (as do the words, etymologically) except what is in technical language called their value. Similarly, the Book of Jonah says that the Ninevites do not know their right hands from their left (why, is not clear), and this is a relatively simple kind of opposition or confusion, one that a person can live with (I do, as it happens). Much more radical and disturbing is the confusion expressed in a phrase I read once (I don’t remember the book or author, and Dr. Google is not helpful today) about the confusion resulting from electric shock therapy: “not to know up from Tuesday”. These terms are in no sense opposites, and that is because they share “just nothing at all”. Yes, agreed – opposition is a kind of relation, and a close kind. And our intuitions are sometimes confused about it. What is the opposite of salt? Pepper? Not really. Is knife-fork an opposition, or a kind of metonymy for a left-right opposition? [but left-right isn’t resolvable to mere sidedness + value, is it?] The example of altus is an instructive one because it shows up the habitual associations of different languages and how these don’t often carry over to others. Freud and Abel’s interest on Egyptian is probably affected by this. But cleave cannot be resolved in the same way as altus, nor can ravel, I think; and the article itself is interested in the close relation of opposition that is sometimes produced when these words pop up in poems, in the antagonism produced when senses share much but also stubbornly resist much. I’m not sure complete disrelation (“up from Tuesday”) is disturbing in the same way – psychologically it may be extremely disturbing, but as a feature of artistic production it brings us into absurdism, which is a different kind of confusing, with (by now) fairly well established interpretative (or aesthetically evaluative) strategies. As I say, value is a technical term in the theory of colors, representing roughly what would be called lightness or darkness: pink differs from crimson mostly in value. You shouldn’t read into my use of it more than is there. To a chemist, salt has no opposite, being already a coniunctio oppositorum of acid and base. But chemists aren’t the only people who do polar thinking. When Leo Rosten’s Mr. Kaplan proposes South Carolina as the opposite of North Carolina, Olga Tarnova asks jeeringly “Could Pinsk be opposite Minsk?” And yet in Lehrer’s song about Lobachevsky, the lines “From Dnepropetrovsk to Petropavlovsk by way of Iliysk and Novorossiysk / To Alexandrovsk to Akmolinsk to Tomsk to Omsk to Pinsk to Minsk / To me the news will run, yes, to me the news will run!” shows that there is an odd kind of opposition going on here (if you plot these cities on a map, you’ll see just how roundabout the route is). And my wife, who’s from North Carolina, definitely does think of South Carolina as a very “opposite”, even oppositional, sort of place. Douglas Hofstadter coined or at least popularized the use of forkerism for two words with interchanged final sounds, and by later extension kniferism for two words with interchanged medial sounds. Sometimes the line between a pun and a malapropism is very, very thin. Ravel is interesting. The OED3 says the sense ‘entangle’ is older, if not by much, and suggests that ravel out ‘unspool (as thread)’ may have led to the sense ‘disentangle’, although to a mathematician, spooled thread is as orderly as unspooled thread, and to a dressmaker, even more so. I agree about absurdism, and I was referring to psychological rather than critical disturbance. I was once assured that cleave was the only antagonym, and when I presented a few other examples, was told they didn’t count. A fascinating field of study. There’s an interpretation that conflates “antagonyms” and “homographs”, i.e. in order to “count” the two antithetical senses must come from different etymological roots, while still being represented by the same series of letters. To me this doesn’t seem a useful criterion, considering how little the diachronic affects the synchronic in most language. [ – on the other hand, poetry has the ability activate the diachronic within the synchronic, but I don’t think the case studies in the article are doing that. Maybe the Heaney, but I tend to think not].